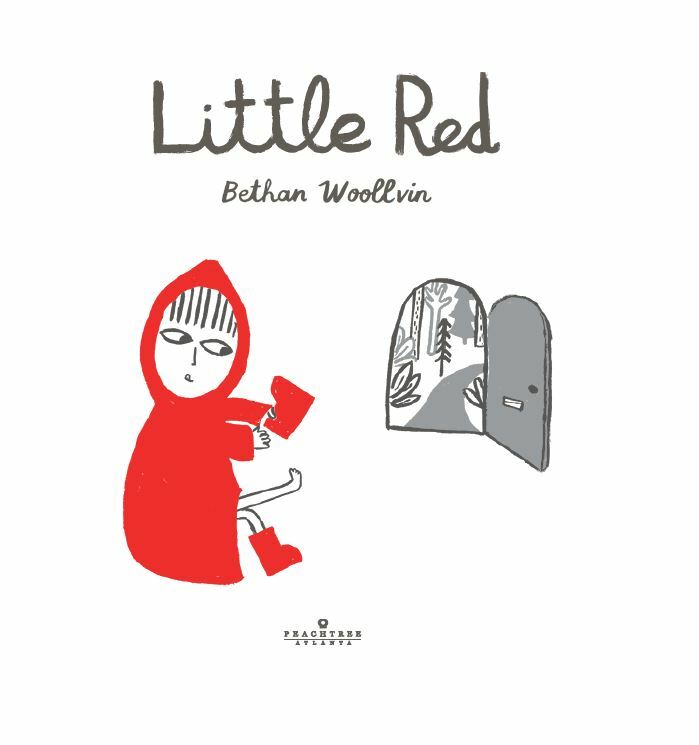 Little Red by Bethan Woollvin (April 2015). This book is a super smart stunner. In fact, I’ve chosen it to be the second in my Elements of an A+ Picture Book series. Let’s have a look at what makes it stand out! 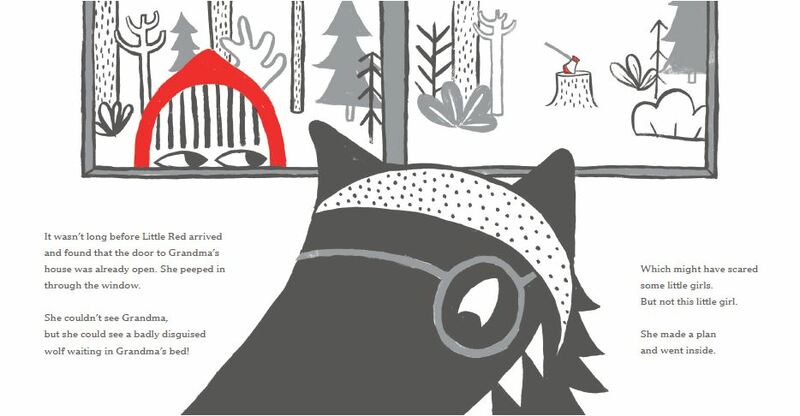 The bold graphic illustrations in red and black and white really pop (see also Louise Loves Art). Here it’s mostly black and white with dabs of red on each spread—usually it’s Little Red herself, but if she’s not present, it’s other red bits to remind us of her. It could be said those dabs of red also reminds us of fierceness in the face of trouble. Something else I love visually is how the forest is non-traditional (I spy cactus-type shapes) and feels Matisse inspired. Just look at that title page! It serves as a portal of sorts into the world Red is about to enter. As she puts on her boots, we’re in a sense putting on our reading boots/eyes/minds. Not only that, but there’s something about Red’s tongue here that tells me she’s determined. That’s an efficient character signal done with just a circle at the line of her mouth! By the time the story proper starts, Red is already out the door and on her way. 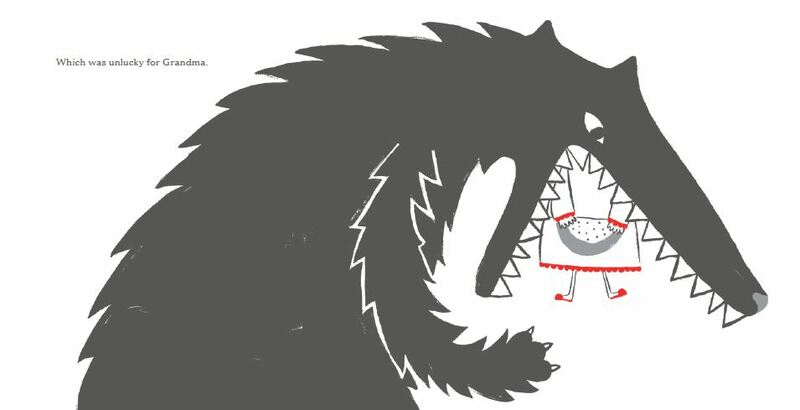 In this telling, Little Red answers the wolf’s questions, but not because of naiveté. Because of strength and fearlessness. Because she can always come up with a plan should she need to. This version has Red knowing she can outsmart the wolf versus not even knowing she should need to. And that grandma-get up that never feels believable in the original tale? Little Red sees right through it. Little Red’s main quality is not being scared. Not because she can’t see the need to be but because she knows her wits will win. And so Woolvin tells us this three times. The last time, the reader will anticipate the phrase—it’s even spread out over a page turn—and it serves as denouement. That axe! it almost gives me a shiver! There are so many visual details to spot in this book: bunny, ladybug, hedgehog. But that integral axe stuck out to me as a storytelling device, a foretelling, a reassuring clue. When Little Red makes her plan, we can guess that axe might be key (but we’re never told!). This page proves the point, right?! Wolf eats grandma and Woolvin does not back away from that fact. And yet there’s a comic effect in there as well, a playfulness that helps the reader cope with those jaws. I find the funny in the angle of Grandma’s feet and legs, a wink to tell us all will be well. There’s even a scene of Red wearing the wolf’s fur. We know what that means! It’s also the first time we see her smile. In my reading she looks more mischievous and wild thing-esque than cruel. She’s celebrating her win in a savage way, but in a sense she’s also playing at this savage stuff. We’re never told Red uses that axe or how. (Thank goodness!) Instead, we’re told what happens around it. “And the wolf leaped forward. Which might have scared some little girls…” That’s followed by that wonderful spread of Red’s eyes only. Those eyes with all the qualities we think of for a wolf: calculating, clever, and cunning. 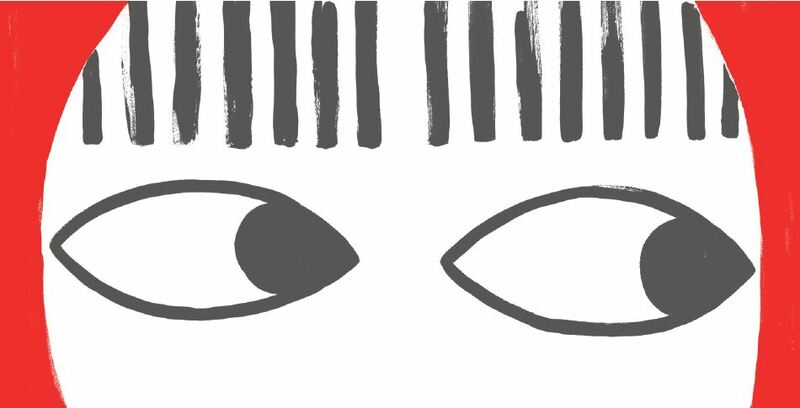 Readers fill in the gaps themselves by following the visual story and clues. It’s not a trick per se, but in my mind it makes reading that much more fun when you’ve got a part in connecting the dots. Big thanks to Peachtree Publishers for images! Where Bear? by Sophy Henn gets my A+ on what makes a picture book tick too! Come see why. And stay tuned for a guest post from Bethan Woollvin on a picture book she thinks is A+! Cannot wait! ← allen say’s picture book life + giveaway! I love this book! Managed to grab a copy at ALA and I had to instagram it immediately–it’s beautiful and every page/spread contributes to the story. Excellent choice for your A+ series! I love the emphasis on shapes in this book. In the way that “This is Not My Hat” leaves things to the imagination, this one appears to do that as well. Must take a look at the complete package, now that you’ve tantalized me with excerpts. Cheers! Excellent breakdown. I’ve done a little studying of Little Red books; now I’ll have to check this one out. Cool! My other favorite is LITTLE RED HOOD (http://thispicturebooklife.com/little-red-hood-2/). What about you? I love the color contrast–Iooking forward to checking this one out, Danielle. 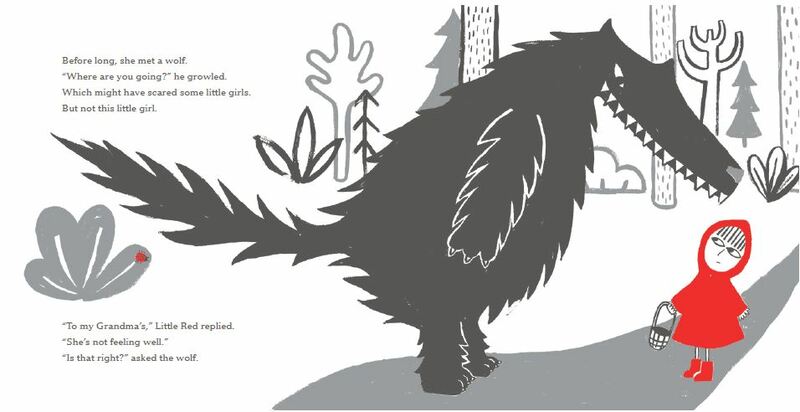 My favorite red riding hood tale is Joan Holub’s Little Red Writing with amazing illustrations that add a whole new level of clever humor by Melissa Sweet. One of my all-time favorites!! Oh my gosh what a great analysis of a most delicious book i now can’t wait to get my hands on. Glad you think so, Maria! Happy to spread the book love!